Singapore can be a very fun city to experience, although it’s one where you have to burn cash to fully enjoy the place. There were cheap thrills, like walking around the city, but there were big expenses too. As you might know, money was tight, and we had to carefully pick out the best places to see given our limited budget. One of the most challenging decisions we were confronted with was whether to take a ride in the Singapore Flyer or to go up the Marina Bay Sands to reach the Sky Park. I rode the Flyer four years ago during its soft opening, so it was an easy pick for me — the Sky Park it should be. However, nobody else in my family experienced the Singapore Flyer, and it was selfish of me to press on going up the Sky Park without considering their thoughts. The Sky Park offers an unobstructed view over Singapore. While the Flyer is made of glass panels, the coaches are also made of metal frames limiting your view. 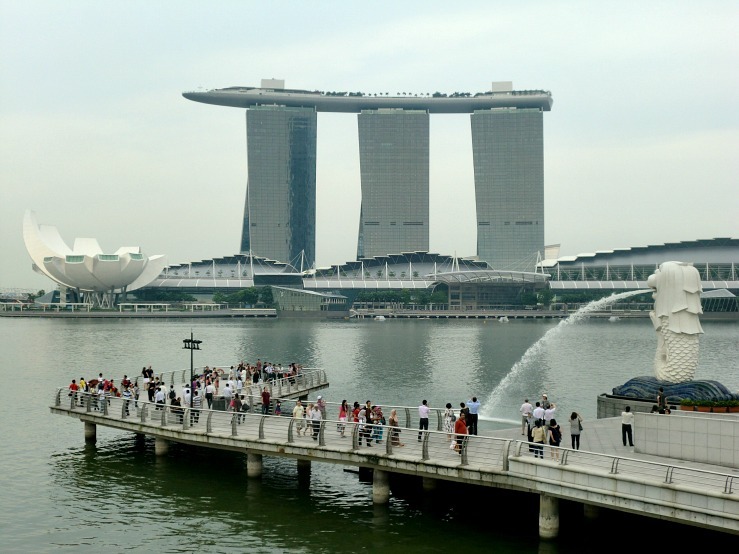 The Sky Park is also higher than any structure in Singapore. In fact, the Flyer seemed like a dwarf compared to the Sky Park. Higher = More places the eye could see. However, the Flyer is the largest observation wheel in the planet. The Sky Park is cheaper than the Flyer. SGD 20 for the Sky Park vs SGD 33 for the Flyer. The Sky Park allows you to stay for as long as you like. The ride in the Flyer takes about 30 minutes. I guess the final sign that made us choose the Sky Park over the Flyer was talking to a fellow Filipino who suggested that the Sky Park was better. I was later proven wrong. I was looking forward to a wonderful experience at the Sky Park knowing that it was probably the best place to see Singapore from a bird’s eye view. True enough, the scenery was amazing. From here, you can see the business district, the Boat Quay, the Singapore Flyer, and the colonial district. We intended to stay until sundown to see Singapore light up for the night. Soon, a lot of people arrived with the same plan as we had. The sad thing was that there was nothing to sit on, not even a bench. Logically, there were people who tried sitting on the floor, but to no avail. Guards soon asked them to stand up, as sitting on the floor or the stairs wasn’t allowed. There was a restaurant and bar at the Sky Park, so we thought that maybe could order drinks and sit down, yet the usher informed us that only when we order dinner can we sit down. Needless to say, I was very disappointed. I felt that I was being ripped off. I already paid for the entrance fee, then I had to pay for a seat. Even the cabins in the Singapore Flyer have benches! Looking back, I realized that the main difference between the Flyer and the Sky Park was simple — the latter is a place, but the former is an experience. Nothing beats slowly being lifted up in the air while seeing the breathtaking view that Singapore offers…and it was surely every Singapore dollar. 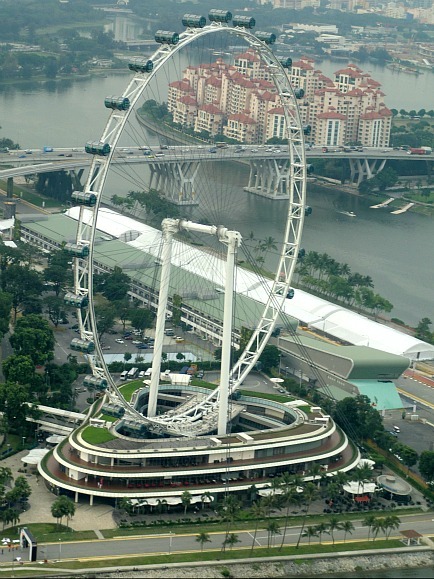 We are glad that you enjoyed your Singapore Flyer experience! Looking forward to your support and having you with us really soon.